Seven Ages of Love Article 1967 This is a January 7, 1967 article. Lovely picture suitable for framing of a young mother holding her baby tightly in her arms. It reads, The seven ages of love. In excellent condition. Photo is taken through plastic and may show wrinkles or crookedness that is not in the ad. This magazine tear sheet measures 10 1/2"" wide by 13 3/4"" tall. 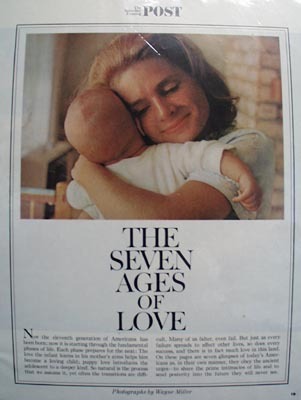 Items Similar To "Seven Ages of Love Article 1967"
Seven Up Fresh Up With Seven UP 1959 Ad.